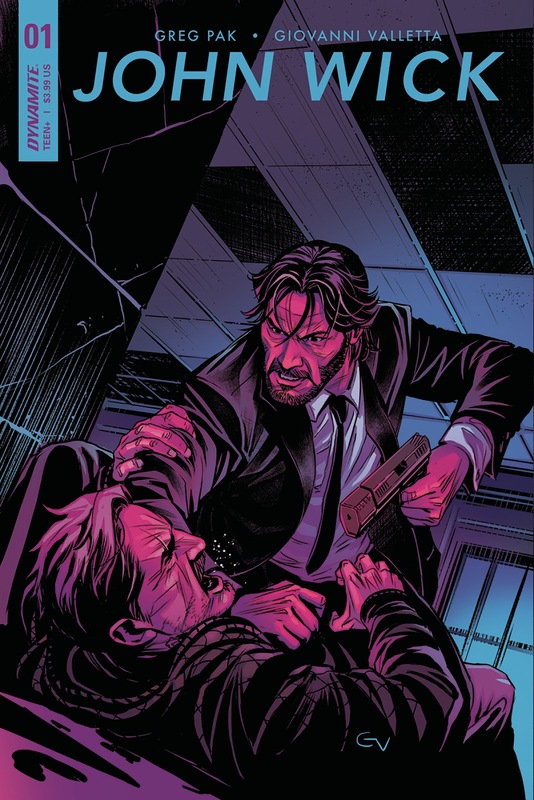 Greg Pak captures the demeanor and deliberate actions of John Wick as the build-up to violence is slow but as exciting and vicious as the films themselves. John's dialogue is expectedly minimal but just the right amount as you can hear yourself listening to Keanu Reeves' voice in your head. It's a good opening chapter to set the stage for John's development and learning of the rules of The Continental Hotel. Giovanni Valletta doesn't include a lot of detail in his panels, transitions are well-paced, and the overall layouts are effective. Some transitions during the fight weren't clear but overall the choreography was as brutal as you'd expect. There's a sparseness to Valletta's art that directs the focus to the characters in the foreground at all times. It kind of feels like in old Westerns where you'd get these tight close-ups of the gunfighters' faces before an all-out shoot-out begins. Here, Valletta uses those close-ups to read the faces of the characters. That's where he's most effective because when you pull back the camera there's a minimalist approach to the art that leaves it wanting. Because of this spartan approach to each panel, Daniel Curiel and Inlight Studios have a lot of space to color and fill-in. The palette is made up of mostly yellows, browns, and reds. It's okay for a dusty old desert but it could have used more of a splash of color in the street, the hotel room, etc. 'John Wick' #1 is an origin story that has the movie's DNA but not quite the polish yet. That's understandable as we learn more about John's background. Pak understands what the fans want and he delivers some bone-breaking, face-smashing, gunplay that has defined the character. He also sets in motion some exciting new dangers that make the next issue a must-buy.